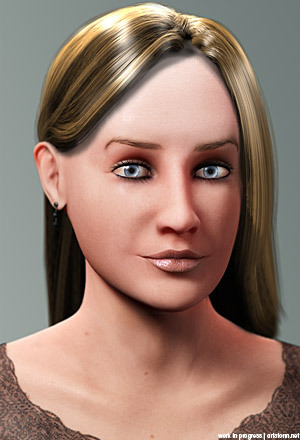 Here’s another update of this CG model, I spent some time with her last night. I modeled a new earpiece for her, fixed the clothing to make them a bit more fitting for her and also did some final tweaks to the skin texture and shading, which I am pretty happy with now. But the major part of the time I spent with her last night went into the hair. Or hair guides to be more specific. The hair in the render to the left is still very temporary, the shading is not correct yet and looks way to shiny, and the shadow has low quality. I dedicated my efforts towards finding an effecient workflow for styling hair guides. Guide styling can be quite tedious, and I’ve decided that I will take all time necessary for this one to find as good flow as possible for that part of the process, as I’ll have so much use for having a speedy workflow in the hair styling department for all my other characters. I’ll continue this process tonight and hopefully get were I want to go with her hair, and when the styling is in place, and I have documented a good workflow for it, I’ll fix the hair shading in FiberFX. If nothing unexpected happens, I’ll have the final image ready by tomorrow, and hopefully be able to post a small breakdown of the process of this character.